Moussaka is one of my favourite meals. 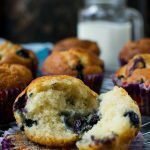 Traditionally it takes a bit of time to make, but this version’s pretty quick and easy – and as delicious as ever! 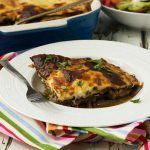 A nice and juicy, full-of-flavour classic Greek moussaka has long been my idea of a pretty perfect meal. Actually, I’m assuming you know what mousska is, which I shouldn’t do. I know what it is because Brits tend to, with Britain being not all that far from Greece (relatively speaking!). And I know how delicious it is after ordering it countless times when I lived in Greece. 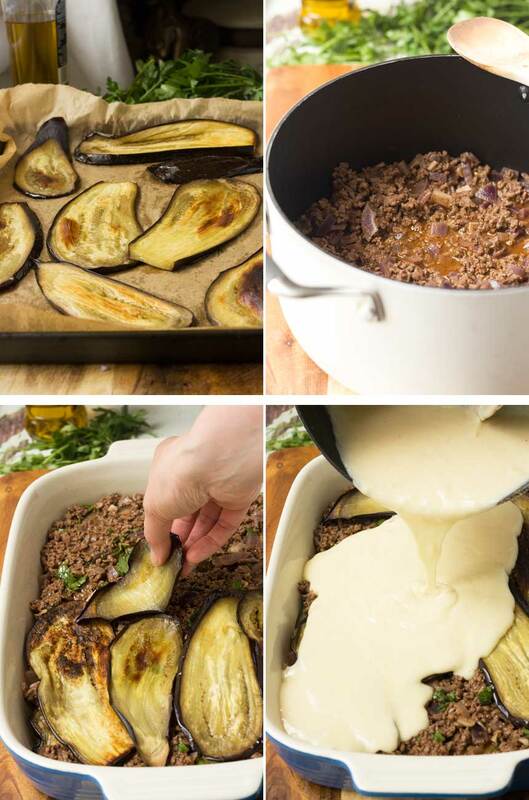 So a moussaka is basically a bit like a lasagna in that it’s got 3 layers – eggplant (aubergine) slices, a rich meat and wine sauce, and a soufflé-like béchamel topping. It’s really popular in Greece, and if you ever go there you’ll come across amazing passed-down-the-generations versions. Like anything, anywhere, I guess you could be unlucky and come across a poor version. But I honestly was only ever served a poor moussaka once during my long period of time in Greece, and that was in a ‘tourist trap’ type restaurant in the centre of Athens (let me know if you go there and I’ll tell you which restaurant you need to avoid!). 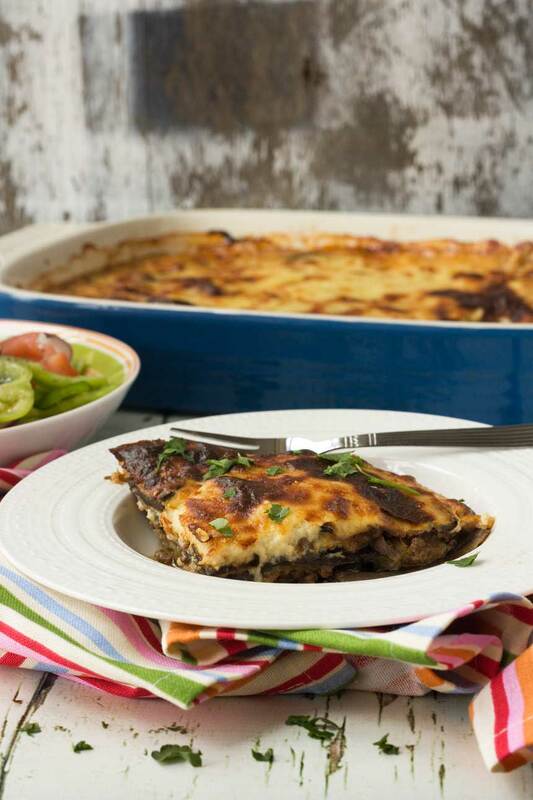 So let’s just imagine for a moment that you got the chance to try a selection of Greek grandmas’ moussaka recipes. I know, silly, but just humour me. 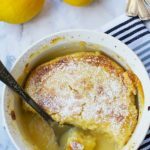 I’m pretty sure you’d find them all a little different from one another, but you would find at least a couple of ‘common denominators’ – namely cinnamon and oregano in the meat sauce, and that creamy, soufflé-like béchamel sauce laced with nutmeg on the top. I’ve been making this particular version of moussaka for a few years now, and it never fails to be delicious. I like it because it’s a particularly easy version (not a potato in sight – I don’t think you need them! ), and the recipe cuts the number of ingredients down to the bare minimum. Moussaka does take a little while to make and cook, because of those multiple layers, so I like to make sure we’re not adding any unnecessary steps. Essentially, I use a recipe I originally found in the Guardian newspaper, but I do add a bit more cinnamon and oregano to my moussaka, to give it more of an authentic flavour. And it really is very easy to prepare. Start by brushing eggplant slices with olive oil and baking. Meanwhile, make a quick and easy meat sauce out of beef (or lamb) mince, onions, garlic, tomato puree and wine. Then a different sort of cheesy béchamel sauce that you whisk a couple of eggs into so it puffs up a bit in the oven like a soufflé. Assemble. Bake. Leave to ‘rest’ for 30 minutes (worth doing). Slice. Eat. Absolutely delicious. The other great thing about this is that it serves at least 6. In fact, we find it’s easily good for 8 because we like to serve it with a Greek salad and some toasted fresh bread. If there aren’t 8 people in your house, it simply means you get to eat this twice and then freeze the leftovers for another time. Bonus! P.S. If you like this, you may also enjoy my skinny chicken moussaka. Feeling lazy? 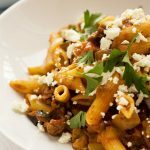 This moussaka penne is pretty darn tasty, too! 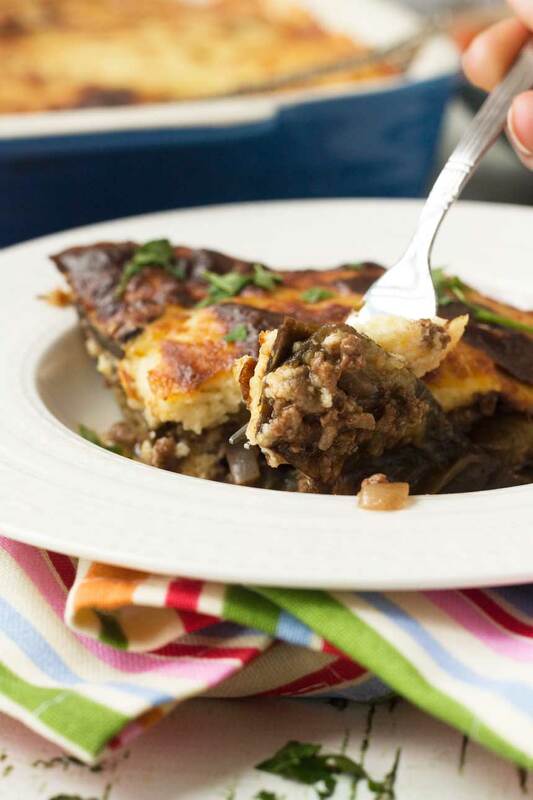 I love moussaka, with its tasty layers of eggplant, meat sauce and bechamel sauce. It's a really hard meal to beat. I love it, but it often takes a while to make. 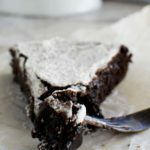 Enter this version, which is lovely and easy, but just as delicious! 2 ounces parmesan cheese or Italian pecorino / Greek kefalotiri if you can find it! Meanwhile, start making your meat sauce. Start by softening your onion for a few minutes in a little olive oil, then add the garlic, cinnamon & oregano and cook for a couple more minutes. Add the meat to the pan and brown while breaking up with a wooden spoon. Then add the tomato puree & water and wine. Let the sauce simmer gently until it has thickened (about 20 to 30 minutes). At the last minute, add in the parsley and salt and pepper to taste. To make the béchamel, melt the butter in a medium saucepan, then stir in the flour until you have a paste. Take off the heat, then stir in the milk little by little. Heat and stir until the sauce is almost bubbling and has thickened nicely, then add most of the cheese and a really good grating of nutmeg. Let cool for five minutes or so, then whisk in the two eggs. Now you’re ready to assemble your moussaka! (I used a 12 x 9 inch baking dish*) Start with a layer of eggplant/aubergine slices, followed by half of the ragu sauce, another layer of eggplant/aubergine, another layer of meat and a final layer of eggplant/aubergine. Finally, pour the béchamel topping over the top and smooth it out. Sprinkle over the rest of the cheese. Basic moussaka recipe adapted from this recipe in Guardian Life and Style. *You can use a baking dish that's a bit smaller than this, but don't use a bigger one. The meat and eggplant / aubergine layers will be very thin layers, but that's fine! You can make this moussaka ahead. Simply assemble fully and cover in the fridge until ready to bake. Add 5 to 10 minutes to the cooking time. You can also freeze the cooked leftovers, then defrost and reheat. Mmm! I had the most amazing moussakas when were travelling around Greece and I haven’t had any since. I must make some soon. You MUST get your hubby to take you to Greece and show you around! Go to one of the islands… you’ll be bowled over by all that amazing food. Just a big bowl of local tomatoes is enough to propel you into food heaven over there! 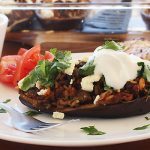 Helen, I had no clue what moussaka was till I read your post! And, till I read your post I had no clue I could crave something I’ve never had but your description of those layers of eggplant slices, rich meat and wine sauce, and a soufflé-like béchamel topping have my mouth watering! 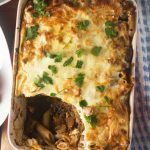 I am not a huge fan of lasagna because of the lasagna noodles in it – but Moussaka has no noodles – which makes it even more appealing to me! I so gotta try this, thanks so much for it! This is one of my favorite meals, too! I can’t believe I haven’t made it in a long time! Looks delicious! Can’t wait to visit Greece again! Pinning! Have a nice weekend! I have never had moussaka!! Why oh why? I love everything about it – honestly my kind of comfort food. We often get eggplant in our farm share, so I’ll be trying this very soon!! Greece is most definitely on my bucket list!! For sure, my hubby would try this dish!! I love the layers in yours and that eggplant looks so amazing. 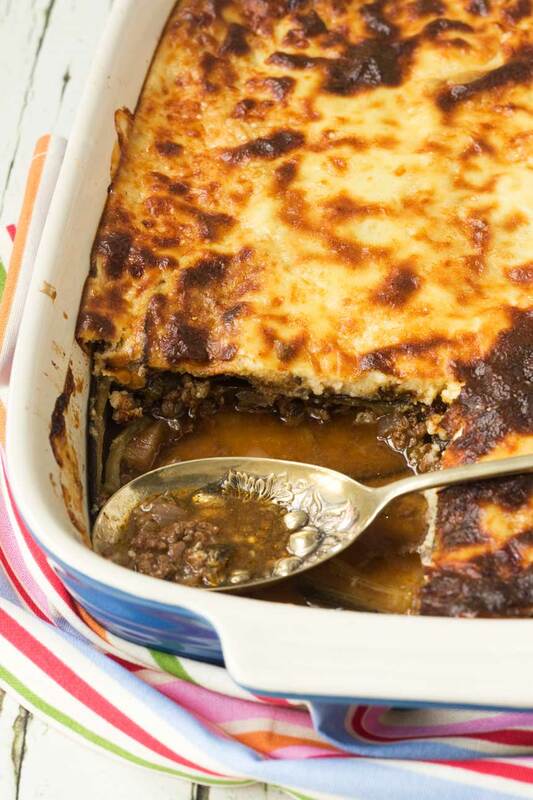 You have to go to Greece some day, Jessica… and in the meantime, please do try moussaka! I’ve never had moussaka before but I’m absolutely loving eggplant for some reason this summer! I definitely want to try it! Whenever I see a moussaka recipe I wonder why I’ve never made it and thanks to you I now have a fast and fabulous recipe. Yes, WHY haven’t you ever made it, Janette! You must!! Nice short cuts! As much as we all like quick dinners sometimes the extra effort is worthwhile..I love finding an episode of Desert IslandDiscs to listen to whilst i prep and cook. Just goes to show the old recipes never go out of fashion do they? 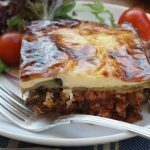 this is a neat recipe but as a greek who cooks mousaka let me give you the secret of the dish…it’s simply the bechamel,this considers if it’s a succesful,respectable piece of an original greek mousaka. 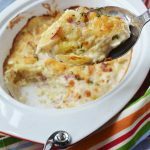 You spread some cheese over eggplants,you mix some cheese in chopped meet,some nutmeg as well,in there, and most of cheese you add in bechamel.You keep some to cover on top….that’s it! Often we Greeks reduce eggplants and add some fried potatoes,too. Tried making your mousakka tonight. What a mess I made! The sauce overflowed all over the oven! But my gosh was it tasty! My family ate in complete silence and, if you knew them, you would know that that was a rare occasion! Thanks so much for bringing a taste of Greece to a one bed council flat in Hull! Hello Carrie! Oh dear, I’m so sorry about your oven! I hope you got it nice and clean again!!! Apart from that though, this message has made my day! Thank you so much for taking the time to leave your feedback. I made this again recently, and it was just as delicious as ever. It sounds like you might have plenty of mouths to eat it all up in one go, but I find it goes quite a long way when you serve it with bread and Greek salad on the side. I’ve even considered making two and freezing one for later because I don’t think it would be too much more effort to cook with double the ingredients. Anyway, thanks again for such a glowing review! 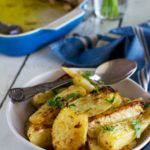 If you liked this, you might also like this Greek chicken and potatoes recipe which I’m just about to update (it’s a really old post but I still make the recipe a lot!). 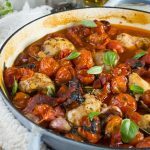 It’s also a one pot meal, but much easier and quicker than the moussaka. I’m making this for my family tomorrow and serving it with a Greek salad. This was a really nice find. I followed all of the suggestions to make it more healthy. Thanks for your recipe!! Hi – Nice recipe. I’m trying it tonight. I’m a bit confused by the amount of red wine though… 2 thirds (2/3) of a cup of 2 or 3 cups? I wasn’t sure so I used just 1 cup, which actually seems fine.